The remarkable rise of Greek architect George Batzios has the makings of a blockbuster film. Batzios grew up in the provincial city of Larissa, a symbol of agricultural life in the heart of central Greece’s fertile plains. Recently, he was invited into the exclusive team of celebrated nihilist architect Jean Nouvel to help design one of New York City’s biggest structures, the MoMa Tower. If this isn’t a success story, then what is? Batzios left Larissa at the age of 17 for Paris with the aim of becoming an architect. When he eventually sent his resume to the architectural firm headed by Nouvel, Batzios was not only hired straight away, but immediately picked by Nouvel to work alongside him on the firm’s biggest projects, such as the MoMa Tower, the design stage of which began in 2006. Today, the tower on 53rd Street stands proudly at a height of 320 meters, making it one of the city’s tallest buildings. It will operate as an extension of the Museum of Modern Art, while a second section will house a hotel and apartments. Soon after, Batzios met his wife, an Athenian. To split the distance, they decided on London as their base. Subsequently, Batzios began working with yet another celebrated figure, the British minimalist architect David Chipperfield. However, the nostalgia he felt for Greek life took over. He ended up returning to Greece permanently in 2011. “Sea, sun and the living is easy,” Batzios replied simply when asked to explain the attraction, as he sipped his tea at To Tsai, an Athenian teahouse which he designed. 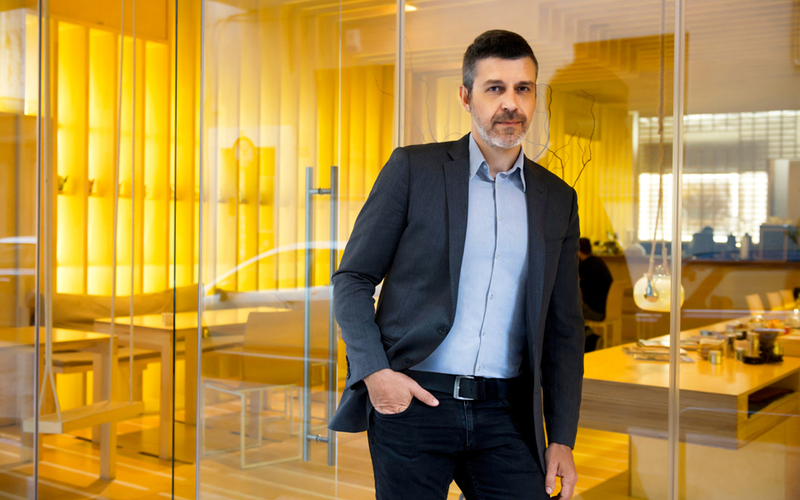 It was the architect’s first project in the Greek capital, a city he finds charmingly chaotic. Where does the field of design stand in Greece today? Around me, in crisis-struck Greece, I see that a “quality not quantity” state of mind is also being manifested in design. Shops are becoming more specialized and leaner. I think this signals a change in Greek lifestyle. I also detect a sense of minimalism in the work of young architects – like an unofficial new movement. Taking an architectural glance at Athens what do you see? Antennas, balcony awnings, hanging laundry, railings and solar panels! Since returning in 2011, to live here, my work has become increasingly minimal. As an architect, I function like a chameleon. I feel that things need to be toned down amid the current situation being experienced in Greece – both as a result of the crisis and the chaotic urban planning environment. To put it visually, if the Paris of Georges-Eugene Haussmann (a 19th century urban planner) is at one extreme and characterized by an overwhelming repetition of form, which can be dull, then Athens, a place of thousands of images, is at the other end. You go out and your head starts spinning as a result of it all. If you could demolish a specific type of Athenian building, which would it be? The modern apartment building; a new monstrosity ‒ all those post-modern buildings we see in the upmarket northern suburbs of Vrilissia, Melissia and elsewhere. They are very expressive, feature intense and uncommon colors, such as burgundy and orange, as well as features – for example, large walls with a round window – that draw attention for no reason. To Tsai, a teahouse located in Kolonaki, the Greek capital’s most aristocratic inner district, is an ideal place to unwind after a shopping trip or a stroll in the area. It offers a choice of some 500 teas, served in traditional porcelain pots. The classic Japanese tea ceremony is also observed. The setting is minimal and reminiscent of a perfumery. Nutritious cold dishes are also available, as are tea and elegant tea sets to purchase. What do you find charming about the city’s old urban plan? The urban mixture. An apartment block in Athens can typically house a shop on the ground floor, a medical practice on the first floor, and a lawyer’s office a floor above. This mix is good and functional. Otherwise ghettos would be created, as is the case in Paris. Providing exclusive space only for doctors in one building helps neither economically nor in terms of town planning nor socially. In this respect, Athenian modernism has succeeded. 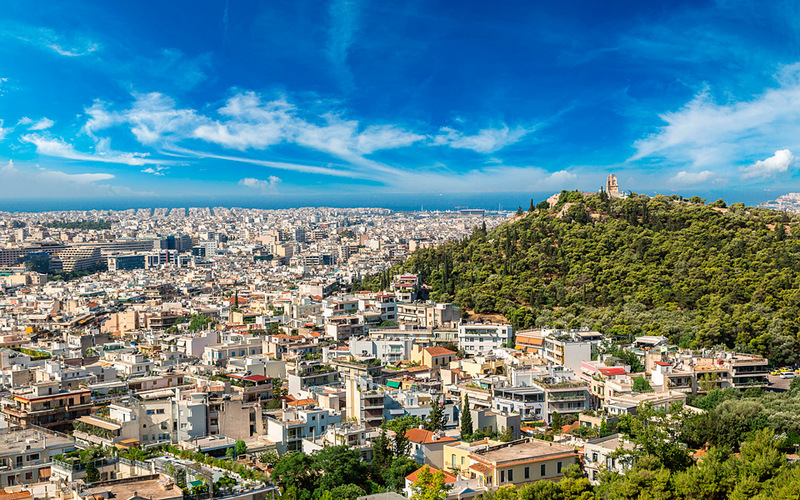 Pick an Athenian architectural masterpiece. 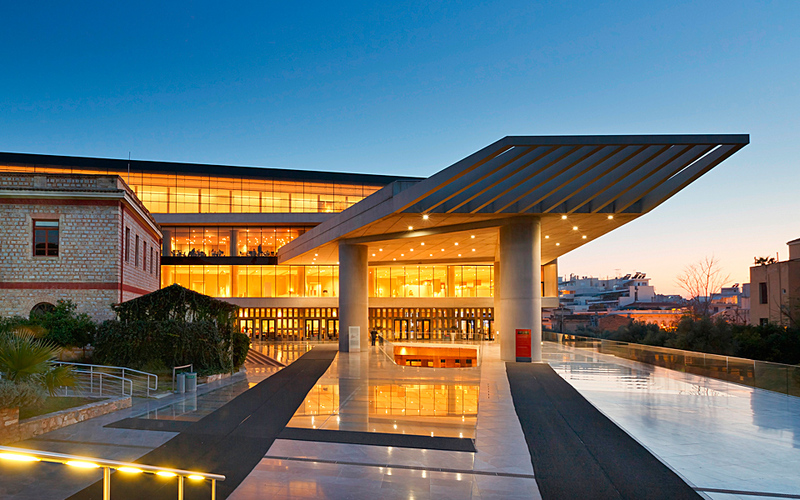 Quite naturally, the Acropolis Museum by Bernard Tschumi. As far as I’m concerned, it is one of the five best-designed museums in the world. It is a symbol for the wider surroundings, not just the archaeological element. Every single detail has been attentively designed and is based on the inner core of Greekness. The museum’s interior space carries a lot of modern elements. It is reminiscent of a Le Corbusier building. Of course, I expected nothing less from Tschumi. He is like Stanley Kubrick. You never expect anything bad. 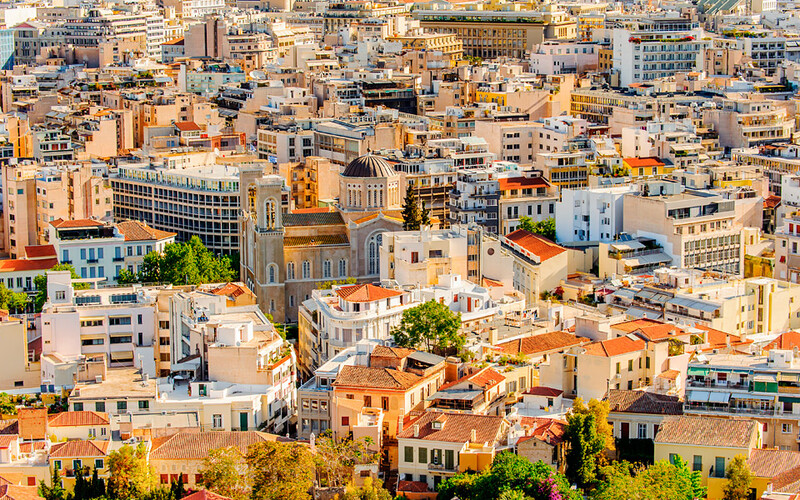 Is Athens a city for romantics? I wouldn’t say so. It’s more a city for anarchists. Romanticism requires intense natural elements if it is to be expressed, such as the sea and rivers, as well as academically sound planning, in terms of functionality and aesthetics. Paris is romantic. I can’t describe our cement city as being romantic. What’s your favorite street and why? The beginning of Ermou Street in the Gazi district. I like it because it combines various urban planning and cultural elements – antiquities, industrial buildings, graffiti, locals and visitors taking a stroll – and also as it is well designed with thoughtful architectural details. This is one of the few truly European landscapes to be found in Athens. I’m sure that the Stavros Niarchos Foundation’s new Cultural Center in the Faliro delta along Athens’ southern coast will become my favorite place. So, then, what is it that you like most about this city? The chaos is the charm and torment of Athens. We need a framework that defines certain basic characteristics of a European city and which can be used to enhance the city’s charm. Barcelona, for example, has managed to reach a state of controlled chaos. Athens can try and do the same.